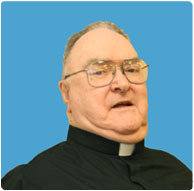 Redemptorist Missionary, Superior, Parochial Administrator and Hospital Chaplain, Father Vincent Paul Crotty, remembered by many as a gentleman and as a “gentle” man, died on December 16, 2011 surrounded by his confreres in St. John Neumann Residence at Stella Maris in Timonium, MD. Father Crotty was born in Sayre, Pennsylvania on November 29, 1923 and professed his first vows on August 2, 1944. He was ordained on June 19, 1949. For the first thirteen years of his priesthood he served on the foreign missions in Brazil in Ponta Pora, Campo Grande, Ponta Grossa, and Curitiba. In 1964 he returned to the United States to serve for more than four decades in parish and hospital ministry in Rochester NY; Ephrata, Lancaster, and Tobyhanna PA; Baltimore MD; and in Bethpage on Long Island, NY. My calling to the priesthood, and more especially to the Congregation of the Most Holy Redeemer, came about in a rather peculiar way… I had never seen a Redemptorist or even heard of them. One day our pastor, Father Houlihan, came into our classroom and asked us what we would like to be in life. Some wished to be doctors, nurses, lawyers, soldiers, and teachers… When he asked if any of us ever thought of becoming a priest, I raised my hand… Later, after consulting with my parents, he recommended that I apply to the Redemptorists where he himself had once studied. I was accepted into their seminary at the age of thirteen, maybe more motivated by their sports facilities than by any religious spirit at first. But that changed as I grew older and more mature. During his assignments on the foreign missions Father Crotty performed both city work and fazenda work — these were outlying districts in the country that he could only reach by horseback once a month or even just once a year because the chapels were so remote. As was the custom, he would send word ahead of time that a priest would be arriving in a few days. Then the people would come to receive the sacraments of Baptism, Marriage, Confession, and Communion at Mass. The bishop could only come once every five years for the sacrament of Confirmation. Father Crotty would spend a day or two in one place and then move on to the next. Each celebration ended with a big fiesta — especially when the bishop was there — and the bishop would preach in the evening. Between these pastoral visits it was up to the parents to instruct their children in the faith because there were no deacons or catechists. During his assignments in the United States Father Crotty pastored inner-city parishes, country parishes, and was frequently able to offer some ministry in Spanish because of his background in Portuguese. Most often there were schools attached to the parishes which opened their doors to at-risk children from low-income families. During his years of hospital chaplaincy Father Crotty visited patients on a daily basis to bring them the grace and comfort of the sacraments along with his own healing presence. His namesake, St. Vincent Ferrer said, “Whatever you do, think not of yourself, but of God.” Father Crotty certainly personified this epitaph. The founder of the congregation, St. Alphonsus Liguori, wrote: “God does not wish me to speak of justice and punishments, but of pardon and peace.” Of the many thousands of inspirational thoughts that the Redemptorists inherited from this great saint, it was this quote that Father Crotty chose to highlight during his Golden Jubilee of Ordination in 1999. Those who knew him will agree that Father Vin not only chose these words, but also lived them — every day of his life. May he rest in the same peace that he brought to so many others. Amen.